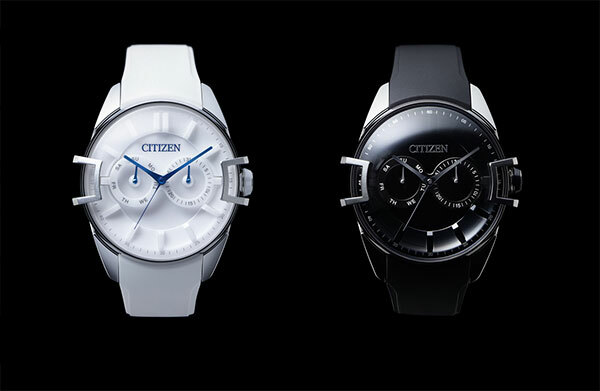 Citizen announced at the end of last year that their 2010 concept model “EYES” will become a limited edition for 2013 of only 250 pieces in white and 250 pieces in black. 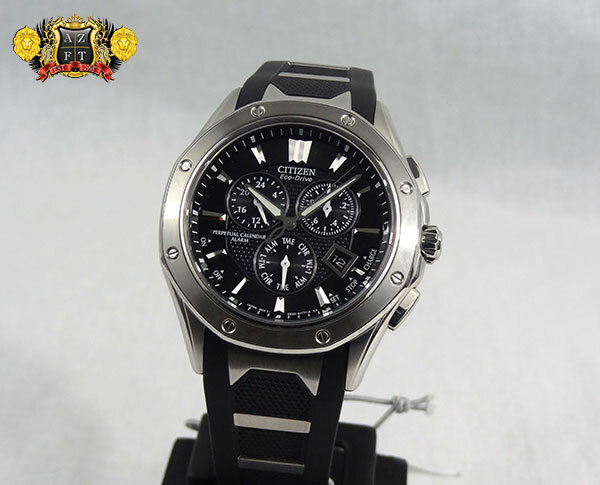 We just found out that AZFT will be getting our hands on this model, but so far have only confirmed the black version. There is much artistry in the design of the EYES. 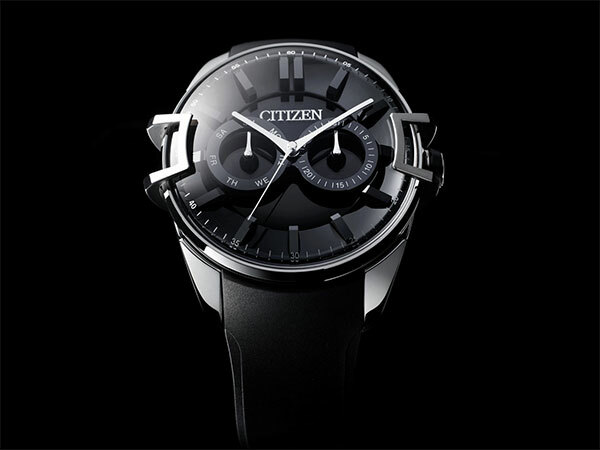 From its unique case shape, crystal and even dial design, there are many attributes that make this new Eco-Drive so much more unique than anything Citizen has ever made. While I would love to get into its details now, I will have to save it for when the watch comes in. I will say that you are starting to see a trend of Citizen’s concept models finally coming to life. With the introduction of the Satellite Wave and now the EYES, who knows which model will they introduce next. Maybe the Nova?? 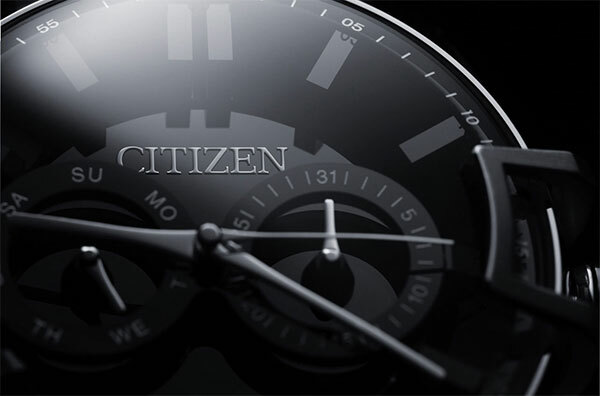 While I don’t think we’ll see anything else new concept wise at Basel World 2013, I am sure Citizen has a wide variety of new introductions that will be very intriguing. 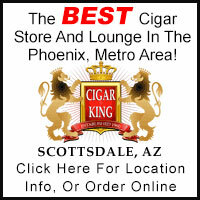 As far as the EYES models go… There apparently only a few to come to the US, and AZ Fine Time is proud to have access. The retail is going to be around $4,700 for either style. Stay tuned to the blog for an in depth review on these concepts brought to life. I hope you enjoyed the sneak peak of what will be coming soon. If you have any questions, please feel free to call us at 1-800-486-3996. Thanks for reading! While these new models are essentially the same as CFD0C001B (which we already reviewed HERE), there is only one difference I had noticed to really talk about. 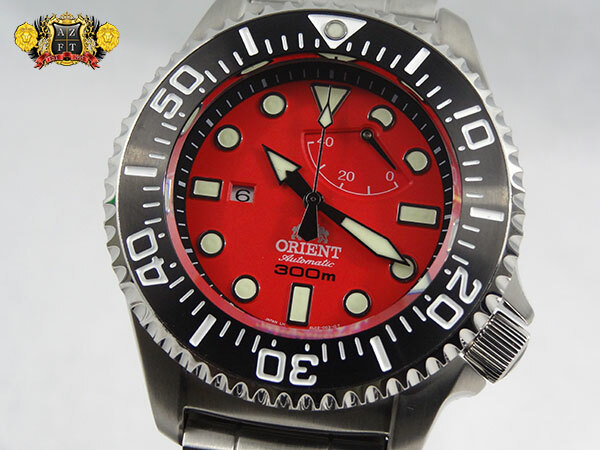 On Orient Japan, they do state that it is a ceramic coating utilized on the bezel (which I did not see on the old version). While I do not have exact info on durability, I am sure that this helps improve the scratch resistance as compared to the older model. 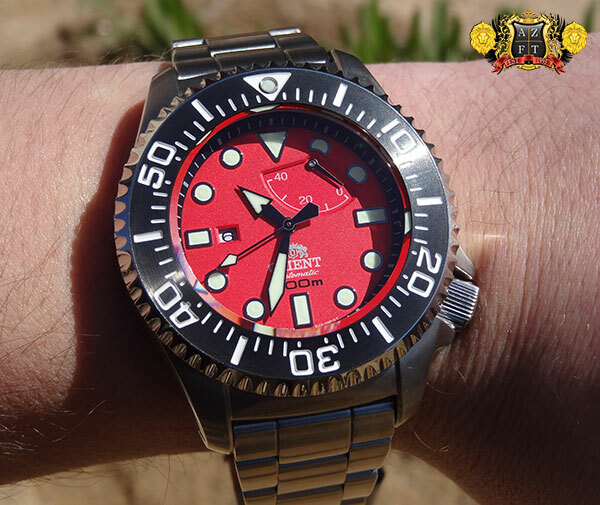 I think these colors are a perfect fit for the new Pro Saturation Divers SEL02003W and SEL02003H. The red is vibrant, but not overbearing. The white is almost a slightly off white or cream color. While it is not pure bright white, I think it is a perfect shade and is very attractive. The attribute I love about both models is the black chapter ring. As small as it is, I think it adds much to the watch that would be lost if it wasn’t there. The dial is very deep, and I think the black chapter ring makes that even more clear in these pieces. We’re loving the Orient collection here at AZFT. This is just another example of their tremendous quality for the money. If you have any questions, please feel free to call us at 1-800-486-3996. 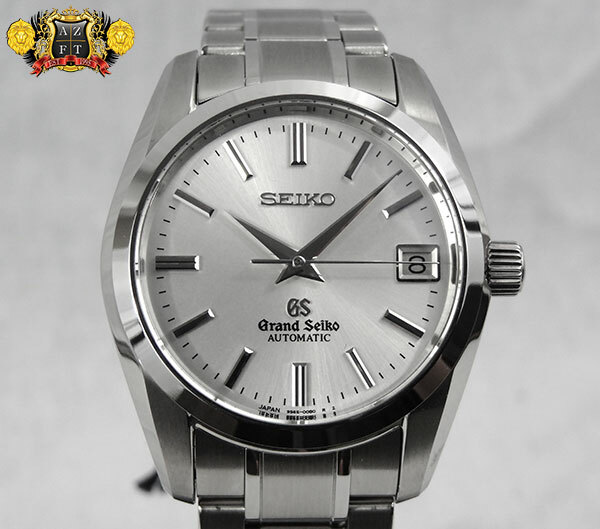 With many great movements to choose from in the Grand Seiko series, what is the appeal of the standard mechanical automatic as compared to Spring Drive, Hi-Beat or even Quartz? To start, the mechanical series is for the purist, who would prefer NOT to have any kind of Quartz regulation in their watch. This obviously eliminates the 9F Quartz, but also the Spring Drive movement. While Spring Drive is a mechanically driven watch, it converts mechanical energy into electricity and utilizes a quartz crystal for timing regulation, therefore eliminating it for the purist (in some cases). The Hi-Beat movement is purely mechanical, and an unbelievable movement. 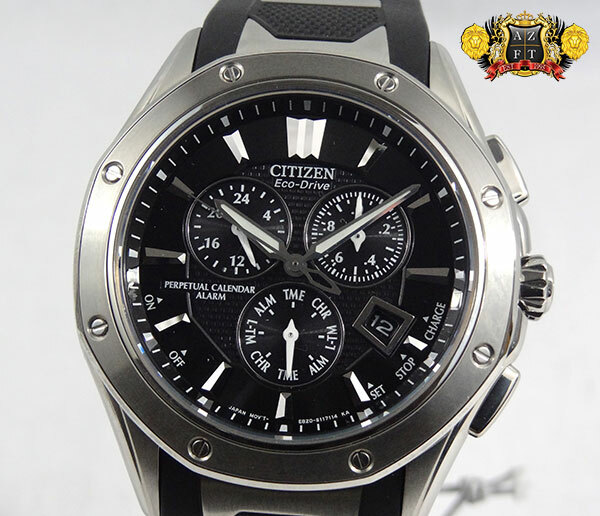 While it has a higher heart rate that allows for finer advancements of the second hand, the price is substantially higher and only has a 55 hour power reserve compared to the 72 hours found in the standard mechanicals. The piece in todays review is for the purist who loves a true mechanical watch, that not only has amazing accuracy, but also has some of the finest components inside, making for some of the highest durability you can find. 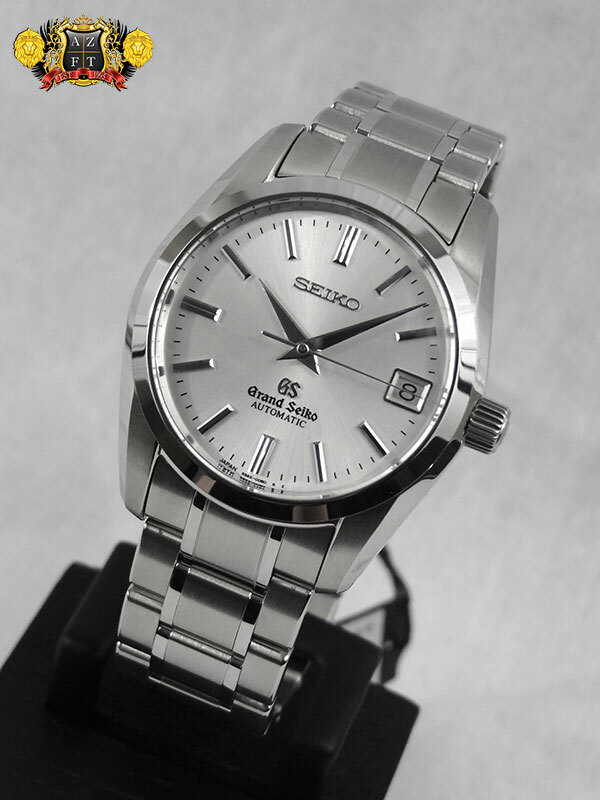 The Grand Seiko Mechanical Automatic SBGR051. 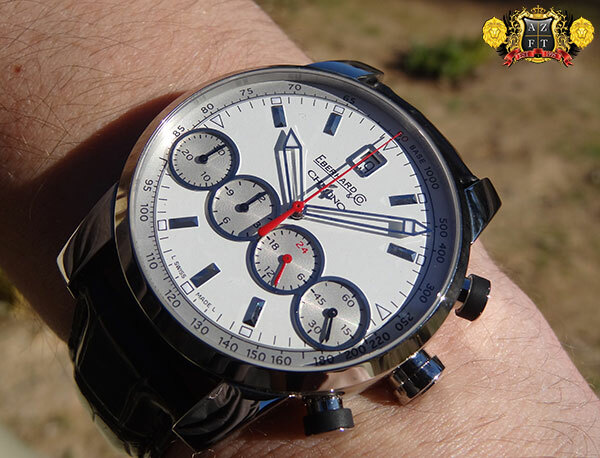 The SBGR051 has a silver dial with a very finely detailed sunburst pattern. While it can be difficult to see, the fine lines of this pattern give the subtle details you typically find on all Grand Seiko’s close up. 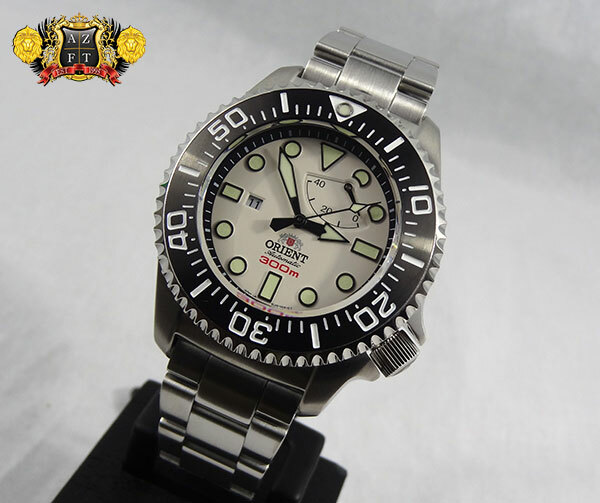 You would also think that a silver dial would hide the stainless steel hands and indexes, but that is certainly not the case. The Zaratsu (Katana Blade) polishing technique used on the hands, indexes and even case give it a mirror like finish. The effect of the high polish makes the hands and indexes appear black in most settings, but also offers a glimmer like a diamond. 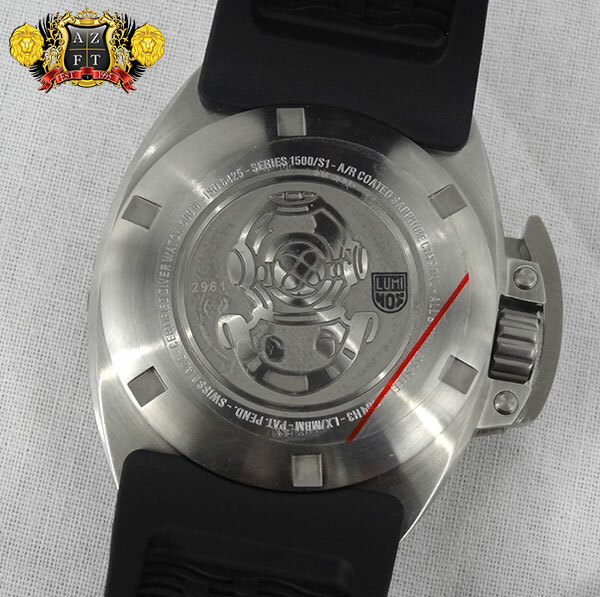 The black look of the steel over the silver dial makes it incredibly legible, which is actually quite surprising. The finish on the case and bracelet are immaculate, and has even been compared to the quality of Patek or Vacheron by avid collectors. I have seen, heard, and even compared this 1st hand. Inside this beautiful timepiece is Seiko’s in-house manufactured 9S65 movement. 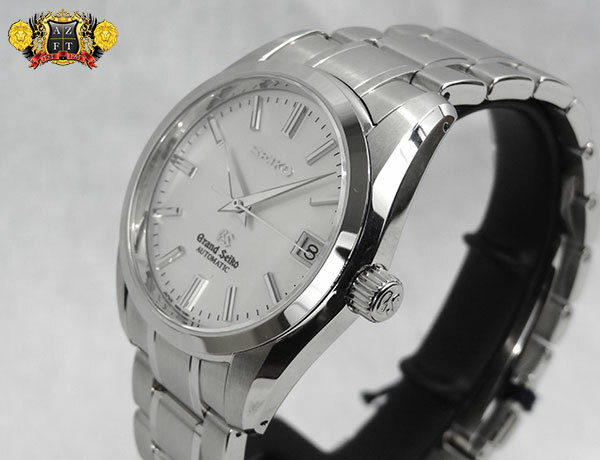 This movement has a rate of 28,800 bph, contains 35 jewels, and has a 72 hour power reserve. In 2010, the 9S65 was introduced and replaced the 9S55. The new benefits of the the upgraded movement were the 72hr power reserve due to Seiko’s new proprietary alloy Spron 510. The other advancements in the movement were in the escapement, utilizing their other top of the line Spron 610 alloy for the hairspring (which is more shock resistant, buoyant, durable and anti-magnetic) as well as MEMS (Micro Electrical Mechanical Systems) manufactured escapement wheel and pallet fork. MEMS allows for smoother, lighter and stronger parts, that benefit not only longevity, but even accuracy. 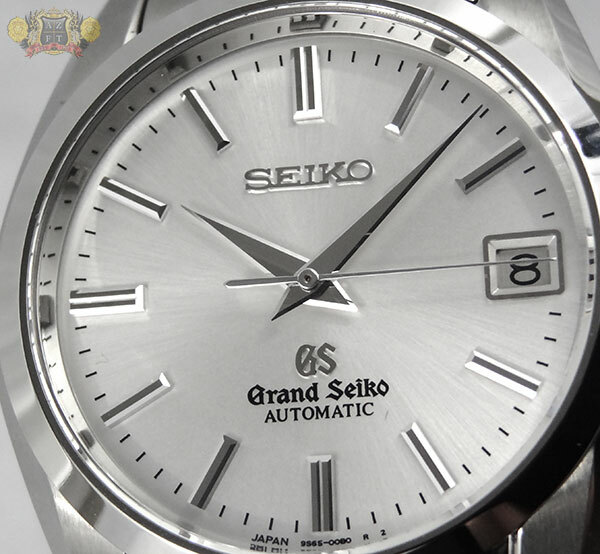 Most importantly, Grand Seiko is rated to perform within a -3/+5 second a day deviation rate. This is even more accurate than Swiss Certified Chronometer and even undergoes a more intensive testing process. 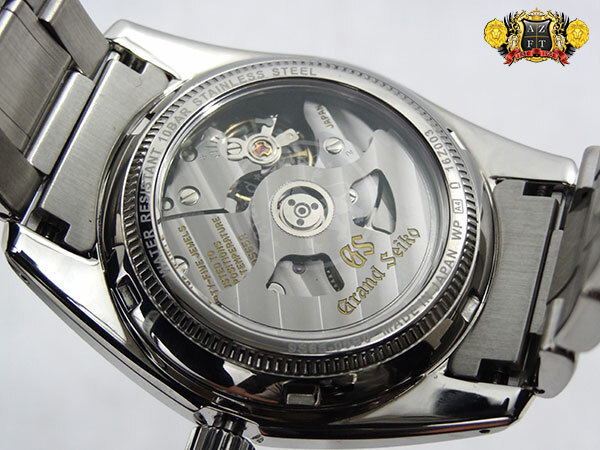 The GS Standard is one of the finest precision ratings you will find in any timepiece today. This model does have a sapphire crystal to expose it’s caliber. If you look close, you can see the illusive GS Lion hologram in the center. These GS mechanical movements (as well as others such as Credor, Galante, Prospex, etc) are manufactured at Shizuku-Ishi Watch Studio in the Iwate Prefecture of Japan. 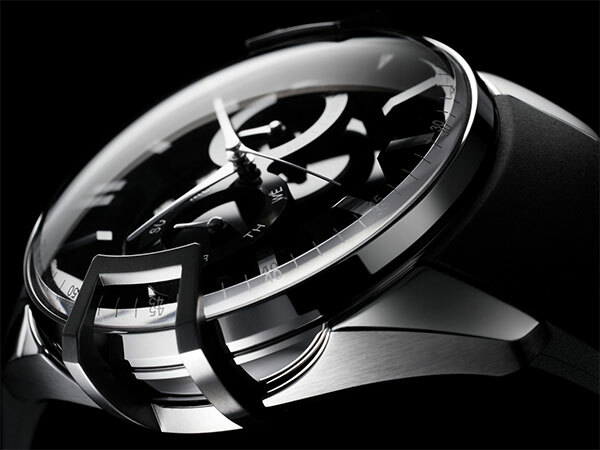 Shizuku-Ishi is one of the only fully integrated manufactures in Japan that makes luxury timepieces. 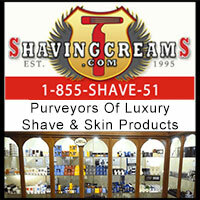 They are also one of the truest vertical manufactures in the industry, making nearly every component in house. 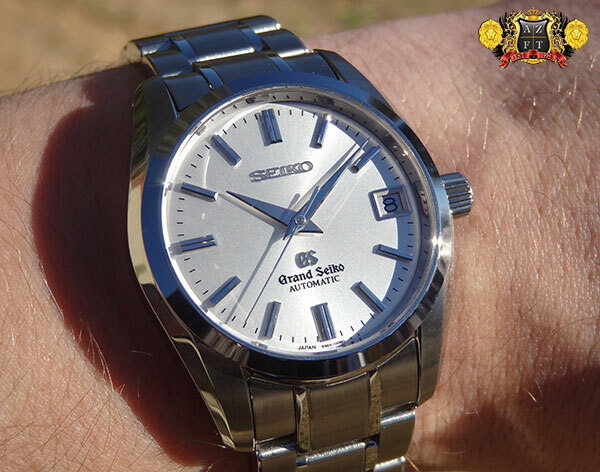 With only about 19 craftsmen working in the studio (who aren’t even all working on GS), it is easy to understand why Grand Seiko’s are such limited availability. Please feel free to call us at 1-800-486-3996 if you have any questions. 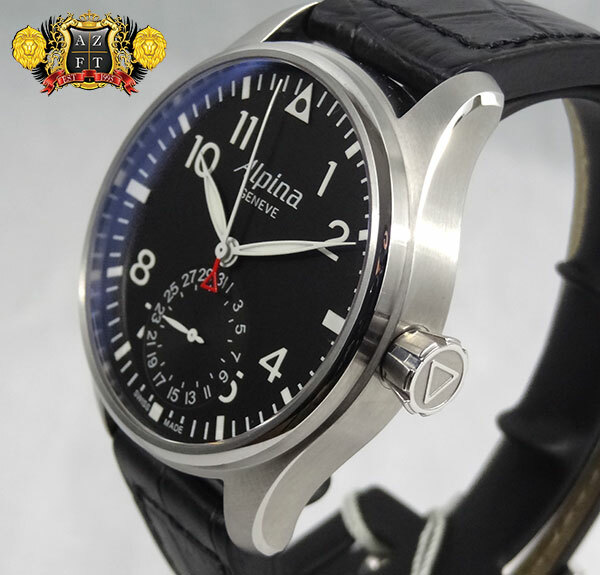 Alpina had hit a home run with their Startimer Pilot Limited Edition series. These 44m Stainless steel cases cam in a fairly wide variety of movement types (Selitta based 3 hand, Chrono and even a regulator). In today’s review, we will be taking a look at their in-house manufactured movement AL-710B4S6. The Startimer Classic series all have a matte black dial with white Arabic numerals, nice sized white hands and their signature red triangle at the tail end of the second hand. While this movement displays central hours, minutes and seconds, it also has a date wheel at 6 o’clock, unlike the standard auto (AL-525B4S6). All models will also have sapphire crystals with anti-reflective coating. The case design is simplistic, but very nice, and has a completely brushed finish. There is some polished accents on the side of the bezel, which add that little detail needed. The bezel is very thin and makes for a ton of dial space. It does make it easy to read, but also gives a slightly larger appearance than some other 44mm’s. The screw-down crown is large and easy to operate, it also gives it that “pilot” type look. The strap is a black leather with folding deployment clasp. I personally prefer the strap to the bracelet variation, but to each their own. The strap is pretty long, and should accommodate to just about any size wrist. 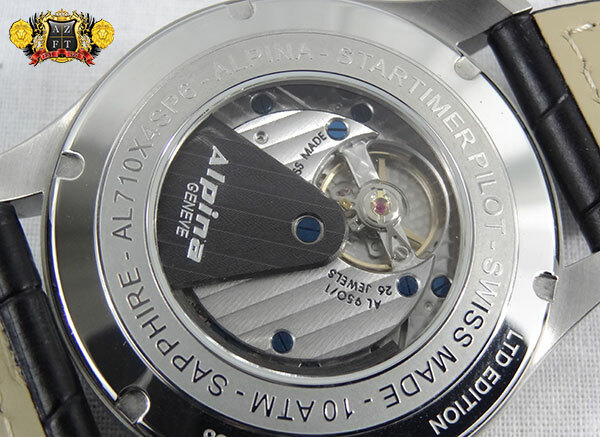 The AL-710 movement (as I mentioned before) is designed and manufactured in-house by Alpina. The decoration is spectacular utilizing Geneva striping, perlage, blue screws and a beautifully deisgned PVD rotor (that also has striping). 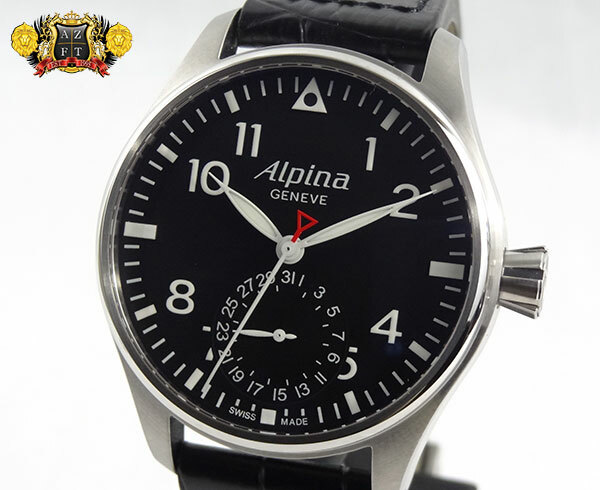 Another fine detail and patented design from Alpina is its escapement at 6 o’clock. Underneath the escapement, you will find micro-perlage, which I really enjoyed seeing in the movement. 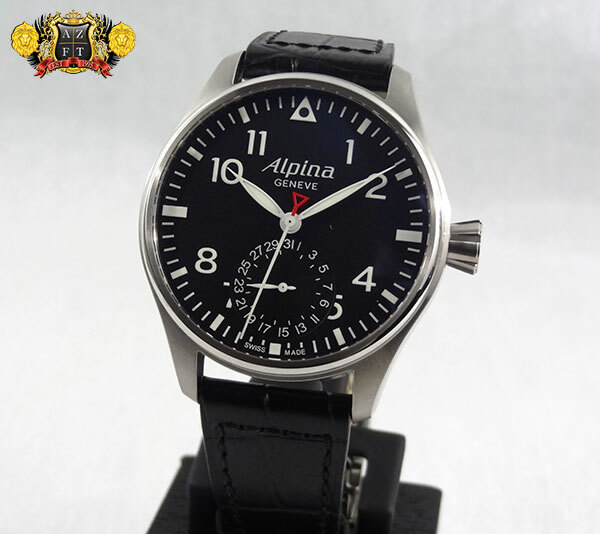 Alpina also rates their in-house movements to -/+ 5 seconds a day, which puts it right up there with COSC standard. 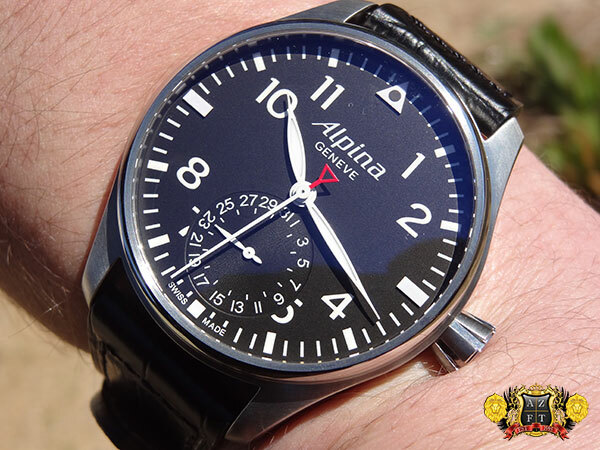 Overall, the Alpina Startimer Pilot AL-710B4S6 is a beautiful piece, and a tremendous value at $2,595 MSRP. If you have any questions, please feel free to call us at 1-800-486-3996. 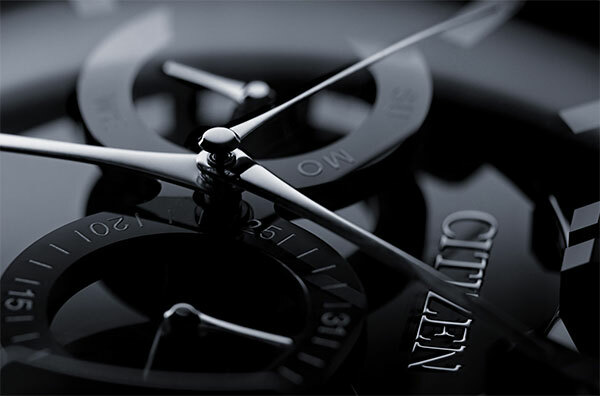 The Citizen Signature Collection has made some major changes over the last year, eliminating many different variations from the line up and adding new things like the Grand Classic automatic and the Octavia Series. The Octavia series has a couple different variations, a standard 3 hand perpetual and a chronograph alarm perpetual. 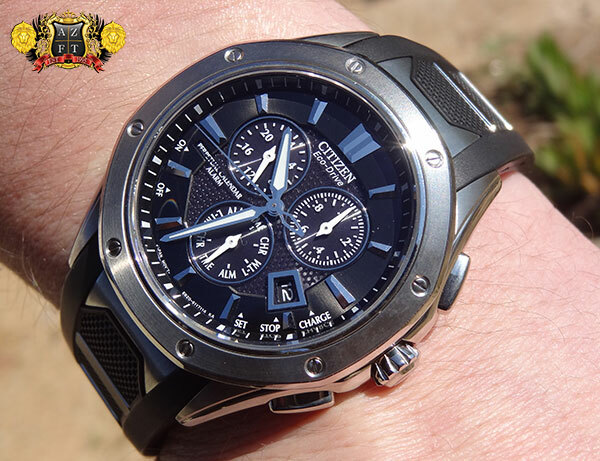 The piece in todays blog is the Chronograph Perpetual BL5460-00E with black dial and black polyurethane strap (that has some sharp looking steel accents). 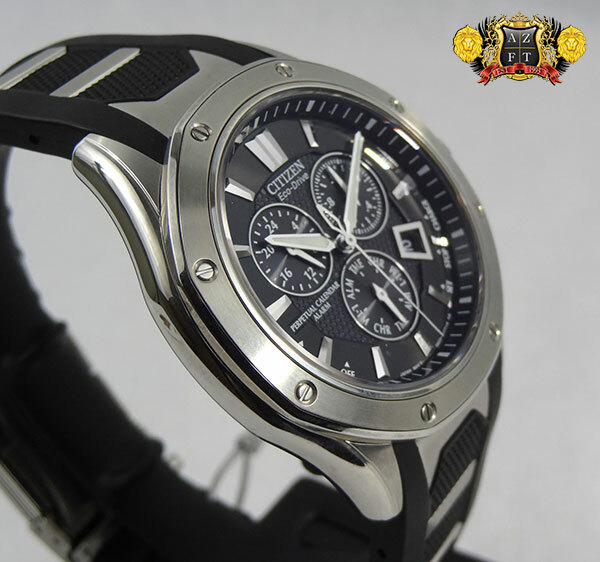 The BL5460-00E is a 42mm stainless steel case, with an octagonal shaped bezel that has 8 screws fixing it in. The case is a combination of brushed and polished, which is done by hand. 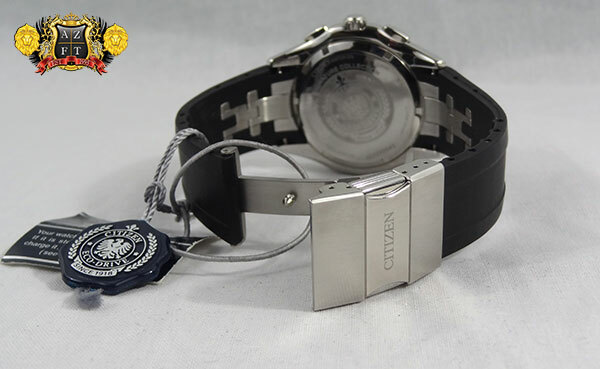 The design of the pushers and crown make to be very comfortable on the wear, and do not dig into your wrist by any means. The hands and indexes are at a very nice high polish, which gives it an attractive look, but also makes for easy legibility. The layout of the textured black metal dial also adds to the legibility, allowing the piece to be complicated without being entirely too busy. The sub dials are marked in white, so they clearly pop off of the dial. The functionality in this piece is great. It has a perpetual calendar (so it always knows the appropriate date, month, leap year), a 20th of a second chronograph, alarm, secondary timezone, and 24hr counter to indicate AM/PM. All of which are controlled by pulling the crown out 1 click and adjusting the mode wheel at 6 o’clock. 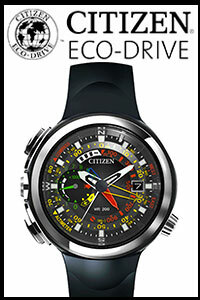 The E820 hand assembled Eco-Drive movement is solar powered, and at a full power reserve, can go 8 months in the dark. You can order this piece directly on our site HERE, or if you have any questions, you can call us at 1-800-486-3996. 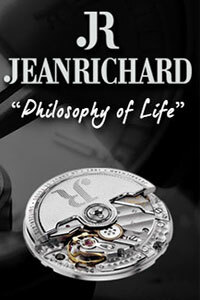 Georges Eberhard founded Eberhard & Co. watches way back in 1887. 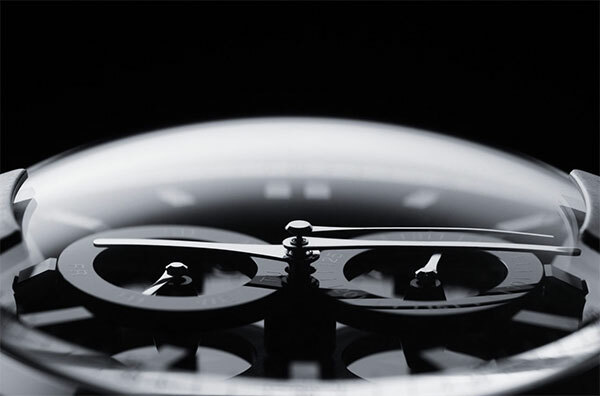 Since the early 1900’s, they became renowned for their Chronometer and chronohraph pieces. 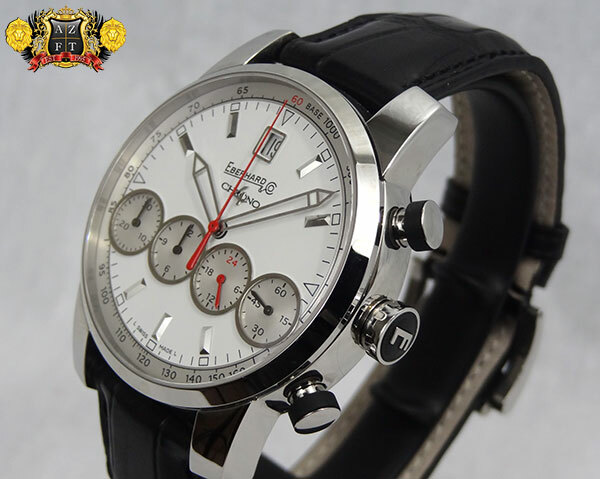 In 2001, Eberhard developed and patented a new variation of chronograph displaying the 1st inline 4 sub dial chronograph, the Chrono 4. 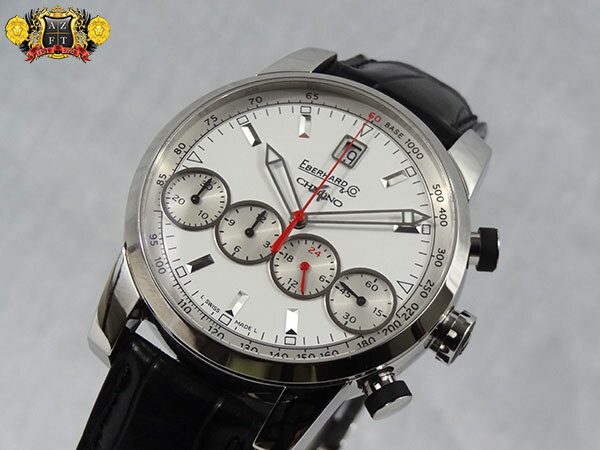 In 2008 they introduced the Grande Taille, a new variation of the Chrono 4 that had a sportier look, larger size and overall beautiful design. 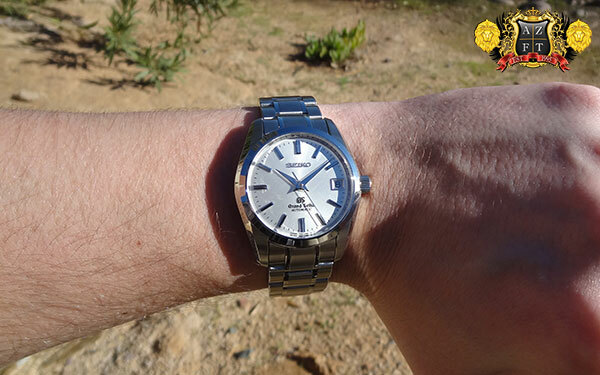 The piece in today’s review, the 31052.1 is a classic, semi-sporty piece that is a true eye catcher. 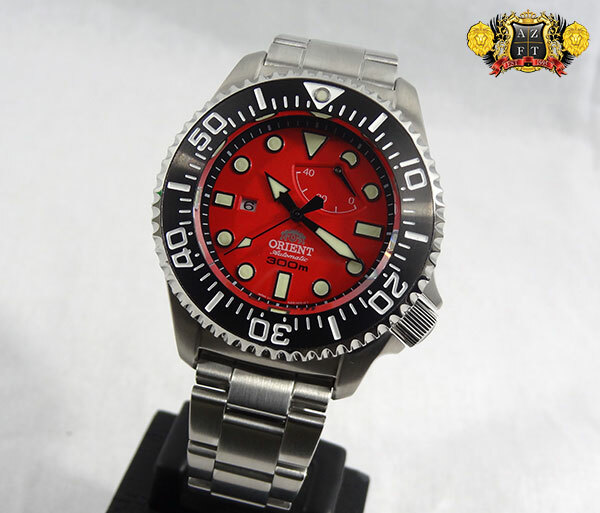 The 43mm case is done in an incredible high polish finish. It is truly amazing how much the quality of finish impacts the total look of the watch. The truly beautiful finish is also implemented on the hands and indexes. In most settings, the hands and indexes reflect and appear to be black contrasting the white dial perfectly, making for great legibility. 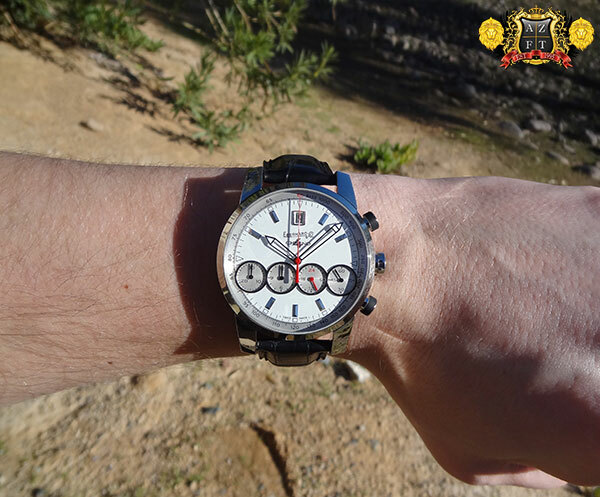 The dial itself is a pure white , with silver Tachymeter scale chapter ring. This subtle detail adds much character. 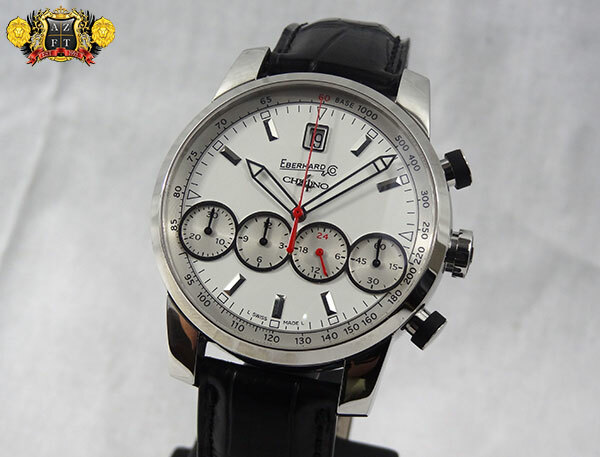 The most unique aspect of this dial, is the way that the chronograph is displayed. While you have your standard hour, minute and chronograph second hand centralized, there are 4 silver subdials that will display chronograph minutes and hours, 24 hour indicator, and actual seconds. 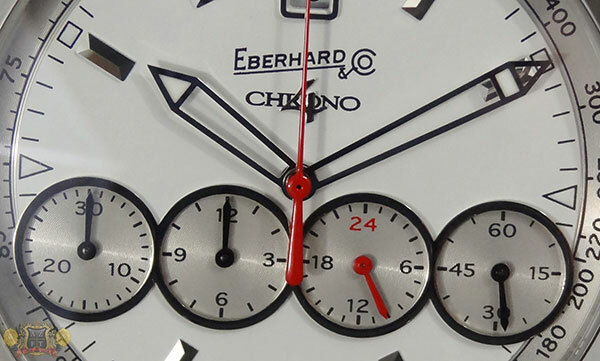 As I mentioned, this display is unique and proprietary to Eberhard. There is also a date display at the 12 o’clock, which is fairly large and very easy to see. The movement inside of the Eeberhard Chrono 4 31052.1 is the EB200, which is based on an ETA 2894-A2. The heavily modified and decorated caliber contains 53 jewels, 28,800 bph and a 42 hour power reserve. As you can imagine, it takes a ton of work, additional parts, and especially patience to make a base movement that generally displays its sub dials at 9, 6, and 3 o’clock with the date at 4 o’clock, to display an inline chrono with an extra 24 hour indicator (which only syncs to the actual time and indicates AM/PM) and has the date at 12 o’clock. This complicated Chrono retails for $7,860. If you have any questions, please feel free to call us at 1-800-486-3996. 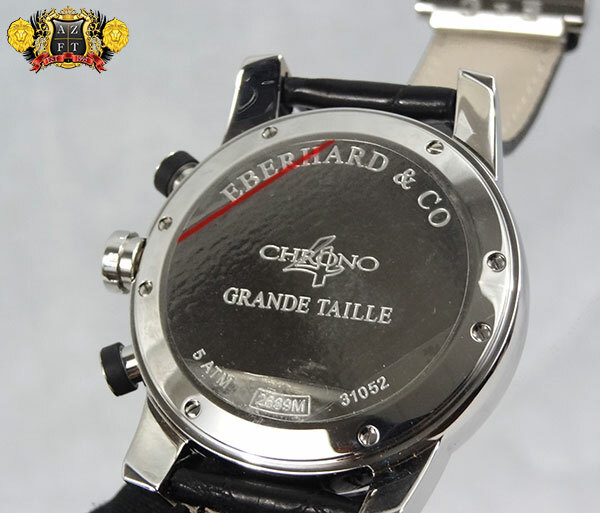 To see more Eberhard & Co. Chrono 4’s, CLICK HERE. 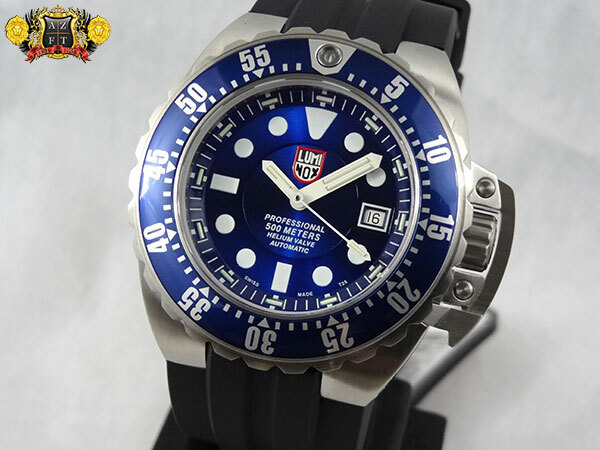 The Luminox Deep Dive Automatics are one of the top quality Luminox you can find. 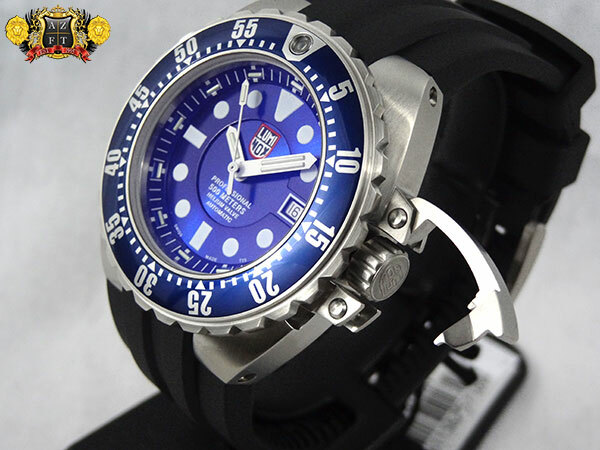 They’re heavy duty, utility dive watches, that overall have a cool look and great functionality. 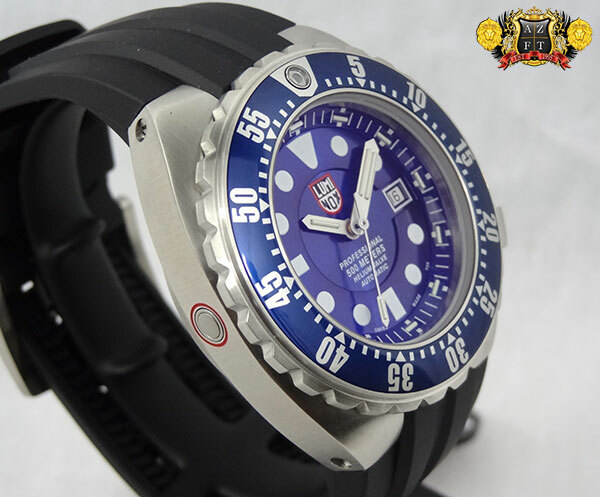 The piece in review today is the Luminox Deep Dive Automatic A.1513. 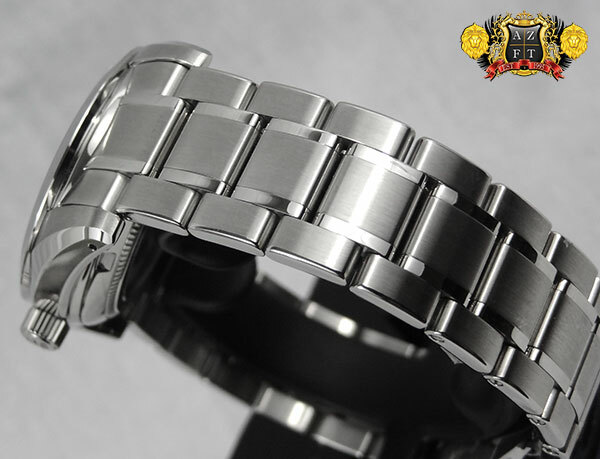 The 44mm 316L stainless steel case is over 17mm thick, a complete brushed finish. 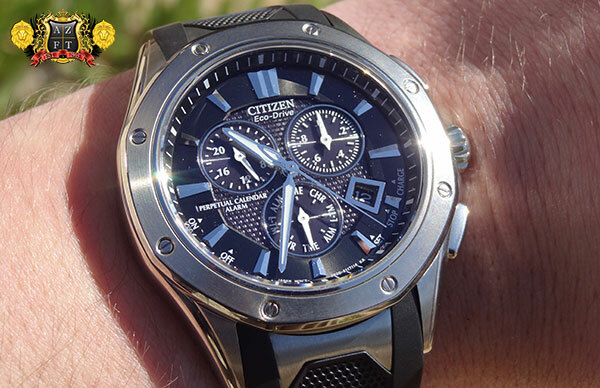 While the watch is large, it wears great on the wrist and has an awesome look. This model has a metallic blue dial and bezel that really make it stand out (there is also a more subtle matte black A.1512). 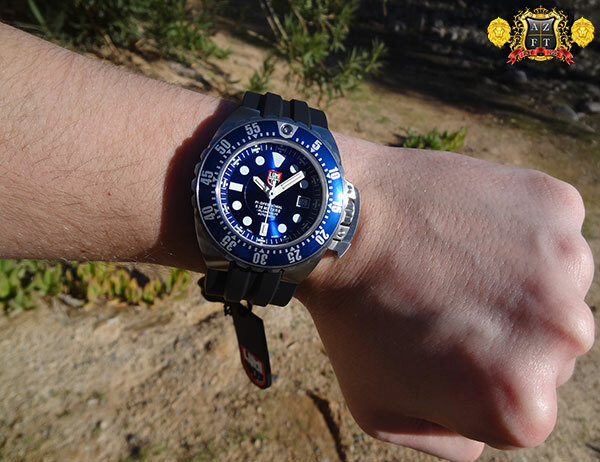 The Deep Divers are individually tested, rated to 500 meters, and ISO 6425 passed. 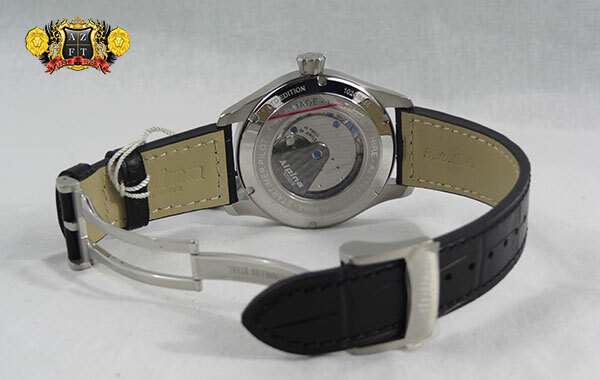 There is an automatic helium escape valve on the left side of the case and a uni-directional rotating bezel that has a patent pending lock, which is actually the crown guard on the right side of the case. 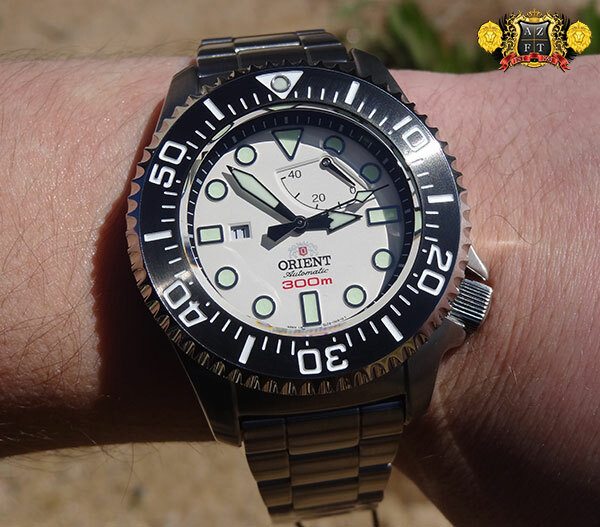 If the crown guard is open, you can adjust the bezel. If the crown guard is locked into place, the bezel is locked also. These Luminox come on a 22mm polyurethane strap, with a 3 tooth buckle that assures its security. The overall weight of the watch is 158g, making it a fairly heavy case with the light weight strap. Even in this situation, the watch still feels well balanced and wraps well around the wrist. 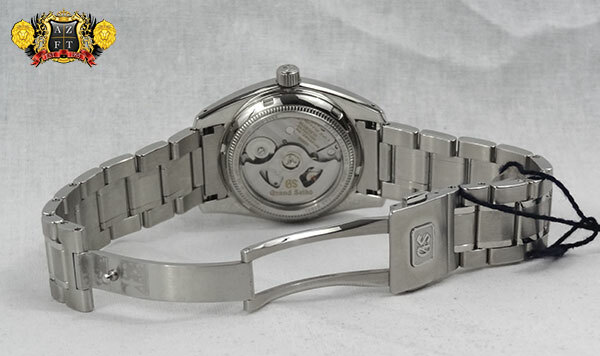 The movement utilized for the Deep Dive is a Swiss Sellita SW-200-1. This self-winding calibre has 28,800 bhp, 26 jewels and about a 38 hour power reserve. Certainly a reliable movement for such a utility watch. 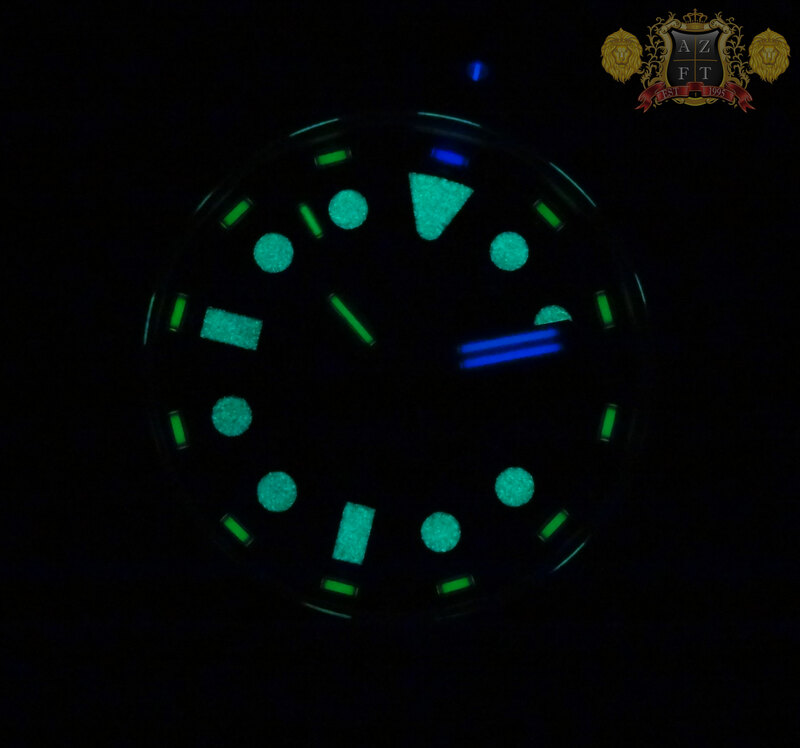 As with all Luminox, the Tritium gas tubes are implemented for night view. On this model however, the Tritium tubes are accompanied by super luminova to make for an even more legible watch in the dark! 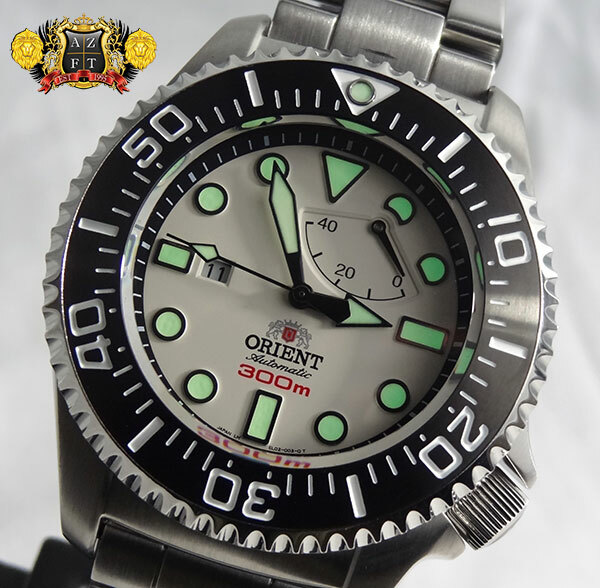 The Tritium is equipted to glow for 25 years continuously, never needing light to make it glow. While the luminova does rely on light, but it still makes for a great glow in dark conditions. The retail on this piece is $2,200, but can be purchased directly on AZ Fine Time for $1,980 HERE. If you have any questions, please feel free to call us at 1-800-486-3996.